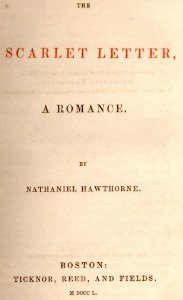 The short list of great American novels is often topped by Nathaniel Hawthorne's classic novel The Scarlet Letter, a primary example of the genre of Dark Romanticism. 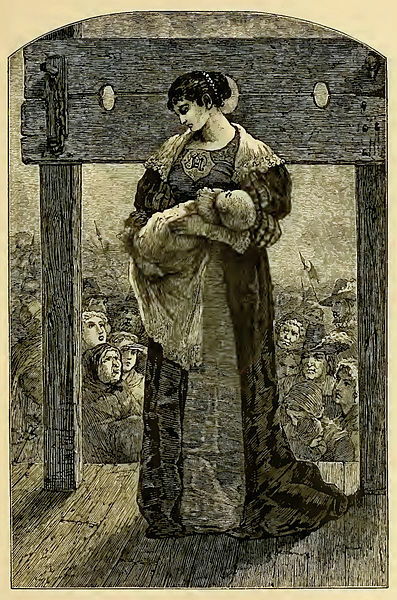 In this story, the consequences of Hester Prynne's adulterous affair with the reverend Arthur Dimmesdale are borne out as she gives birth to their child and is forced to wear a Scarlet Letter A. Hawthorne is at his best as he treats with the complexities of sin and redemption as the story progresses and carries Hester Prynne, Arthur Dimmesdale and Pearl toward their respective destinies. Illustration at right by Mary Hallock Foote, 1878. 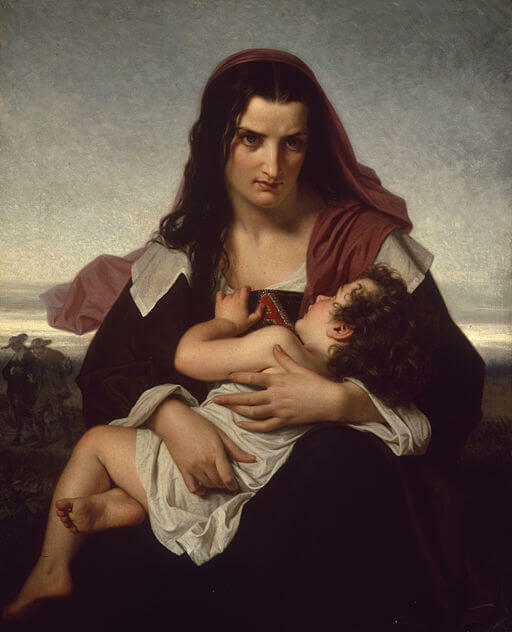 We offer a useful The Scarlet Letter Study Guide for students and teachers. The novel is classified under the Romantic genre and further classified as Dark Romanticism and Dystopian Fiction. I urge readers to study rather than skip over the two introductory chapters; "Preface to the Second Edition" and "The Custom-House." Those two works do not appear alongside the novel by accident, and I believe an appreciation of Hawthorne's experience at the Customs House is the key to a deeper understanding of the novel itself. This novel is a rare work of art. If you are reading it for a class, please cast aside any and all academic considerations. Don't let the assignment intrude on the experience. Enjoy the story as a reader instead of a student. You will have plenty of time for the classroom considerations, but you will probably only read the story once. So do it right. Good luck and most of all, enjoy it! The Scarlet Letter is a true masterpiece of American Literature and a must-read for every student of literature. Featured in our collection of 25 Great American Novels. Teachers and students may be interested in our Dark Romanticism - Study Guide and D. H. Lawrence's chapter on Nathaniel Hawthorne and The Scarlet Letter from his book Studies in Classic American Literature. Return to the Nathaniel Hawthorne library.